A highly excitable gentleman burst into the Lady Lake Historical Museum the other day to declare that his GPS showed his place of residence in The Villages as Conant. Now Conant hasn’t really existed for over 100 years but I guess some things never change. Here is a current Lady Lake Chamber of Commerce map of “Conant” showing US Route 25 (Teague Trail) cutting through the intersection of Griffin Avenue. Only tiny Hood Avenue and Tracy Avenue, directly west of Griffin, maintain the names from the original plat map of 14 July 1884. The Lady Lake Post Office sits on the site of the former Stapylton Avenue which, by the way, still appears on my GPS! I once spent a morning trying to find it. 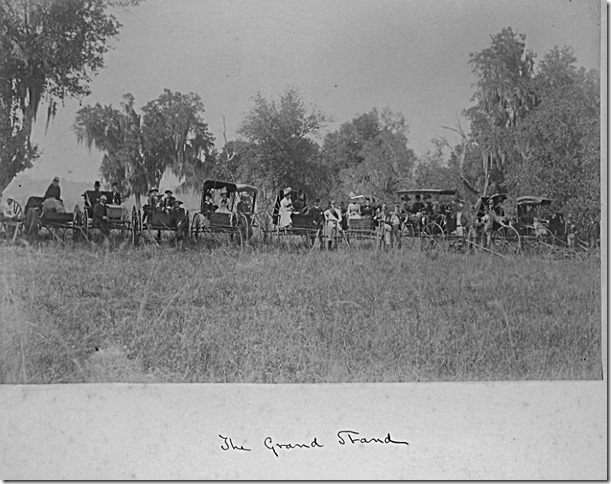 . .
A museum volunteer then steered the man to a poster-sized plat map and pointed out that the depot and hotel were located on the southeast corner of Griffin Avenue and the then Florida Southern railroad track. She and I nearly went toe-to-toe on this claim because of a hand-drawn map of Conant I’d found at the Leesburg Heritage Society. 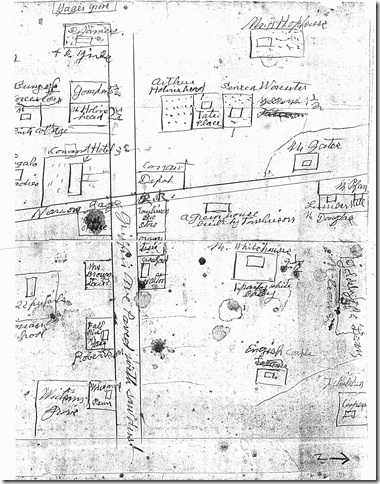 Although just half the map is shown here, based upon pertinent deeds I believe it was drawn in the late 1880s or early 90s—probably by a Conant resident. Obviously, the “cartographer” located the elegant four-story hotel, opened during the winter of 1884, on the northeast corner with its entrance facing sawdust paved Griffin Avenue and the depot directly across the street. The site originally platted for the hotel and depot became the location of the Tomlinson General Store and his large greenhouse. Sheri Hudson, a recent newcomer to this area as well as a history aficionado, and I took a tour today of the Colony of Chetwynd. Although impeded somewhat by the construction on US Route 441 we covered the territory including a drive to one place I had never explored—the location of the Montclair Race Track, one of three race tracks where the colonists gathered for Sunday afternoon races. 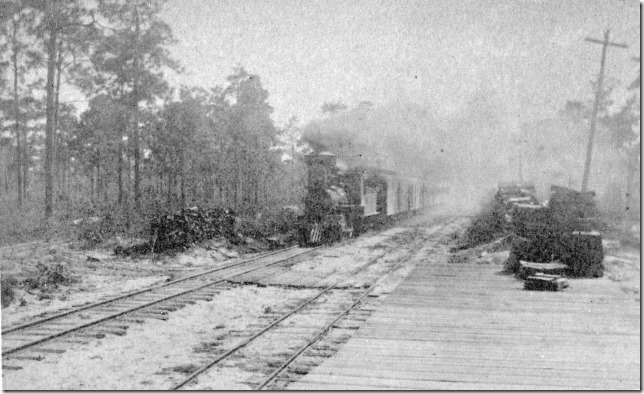 While the picture below doesn’t “show” the precise location of the track it was certainly close by: “bounded by Flatwoods Road on the west and Youngs Road on the south,” according to a later deed. Driving south on Flatwoods from W. Main Street, Leesburg, the scenery turns quite lush and pastoral. 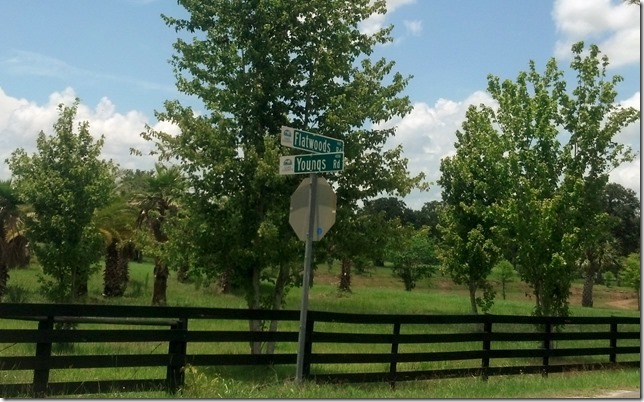 Once at the intersection, Youngs Road ends to the west and Flatwoods to the south. From there back to Stapylton and Company on Zephyr Lake via today’s roads is almost six miles.